This is a guest blog by Ben Wagstaff. Ben did his undergraduate in Biological and Medicinal Chemistry at UEA and then a Masters in Chemistry in Professor Rob Field’s group at the John Innes Centre. In October 2013 he started his PhD which is essentially the Harmful Algal Blooms project. He is now in his third year. When I started my 4 year PhD at the John Innes Centre, I applied for a project in Professor Rob Field’s group that I was told was ‘completely new’ to the research group. This was of course quite daunting but also an exciting challenge and an opportunity to make a real difference! Now, almost 3 years through my 4, I am glad I was given this challenge. The Algal Blooms project at the John Innes Centre first started when keen angler Dr Martin Rejzek, who works as a research assistant with the Field group, recognised the potential of science to combat the ‘real world’ issues caused by harmful algal blooms on the Norfolk Broads. Consequently, a fruitful collaboration developed involving members of the Environment Agency, The Broads Authority, John Innes Centre, Fishtrack and the Norfolk Pike Angling Club – which would later expand to include members from the School of Environmental Sciences at UEA and The Genome Analysis Centre. 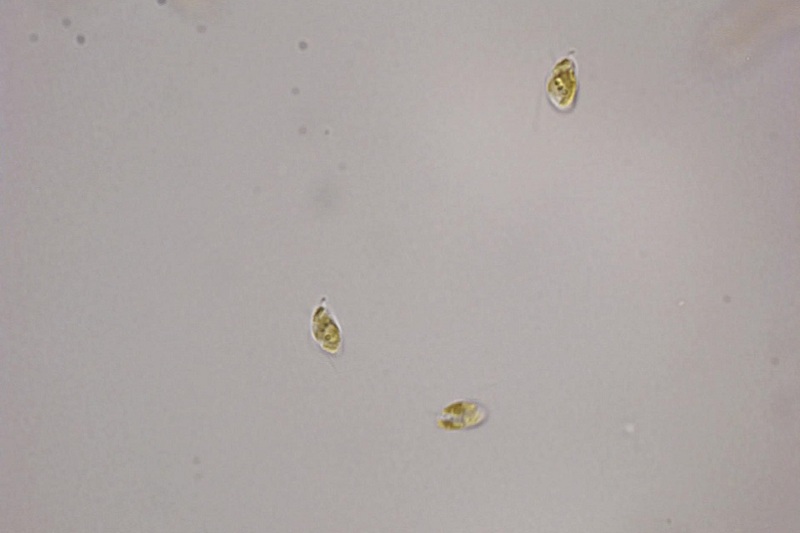 Prymnesium parvum is a toxin-producing microalgae that regularly plagues the Upper Thurne area of the Norfolk Broads with harmful algal blooms, often resulting in thousands of fish deaths. These blooms are becoming more regular, with the increased chance of salt incursions brought about by climate change, and last Easter was a good example of the damage Prymnesium can do when thousands of fish were killed all across the Upper Thurne system. Fortunately, members of the Environment Agency including Stephen Lane and volunteers were able to move nearly 700,000 fish that were in distress; had this not have happened the number of fish deaths would have likely surpassed the hundreds of thousands. This is not a solution however, as the resources and manpower required to undertake such a big move are unsustainable. The key aims we have at the John Innes Centre are based around an early detection of when these blooms are likely to happen – so appropriate measures can be taken before thousands of fish deaths occur, and also the potential control of the blooms when they do occur – again to minimise the number of fish deaths. For the first aim, we are currently studying the interaction the alga has with the surrounding environment, to try and understand the best biomarker we can use as an early warning system. Since the project started, an extremely productive collaboration with the School of Environmental Sciences at UEA has developed, resulting in a rapid and highly sensitive assay for monitoring the number of Prymnesium cells in the water at any given time. Whilst we believe this isn’t a complete solution, this is certainly a huge leap forward over time-consuming microscope-based methods, which have been the method of choice for cell counts to date. For tackling blooms as they occur, we are looking towards chemical treatments as a solution. Algicides, although effective, are too expensive to be used on such a large scale, so we are looking towards cheaper, more established alternatives such as hydrogen peroxide that are already used in cases for water aeration. Work we have carried out in the laboratory has shown that low doses of hydrogen peroxide are fatal to the Prymnesium and also rapidly break down the toxins it produces. We are now conducting analysis, with the help of the Environment Agency, to assess whether this methodology may be suitable for use on the Broads. Through our work with the many collaborators on the project, we are working towards an early warning system that can tackle these deadly blooms once and for all. But as always, phoning in to the Environment Agency if you spot any fish deaths or abnormalities on the Norfolk Broads is an enormous help! The incident hotline number is: 0800 80 70 60.